Objectives More patients are receiving their test results via patient portals. Given test results are written using medical jargon, there has been concern that patients may misinterpret these results. Using sample colonoscopy and Pap smear results, our objective was to assess how frequently people can identify the correct diagnosis and when a patient should follow up with a provider. 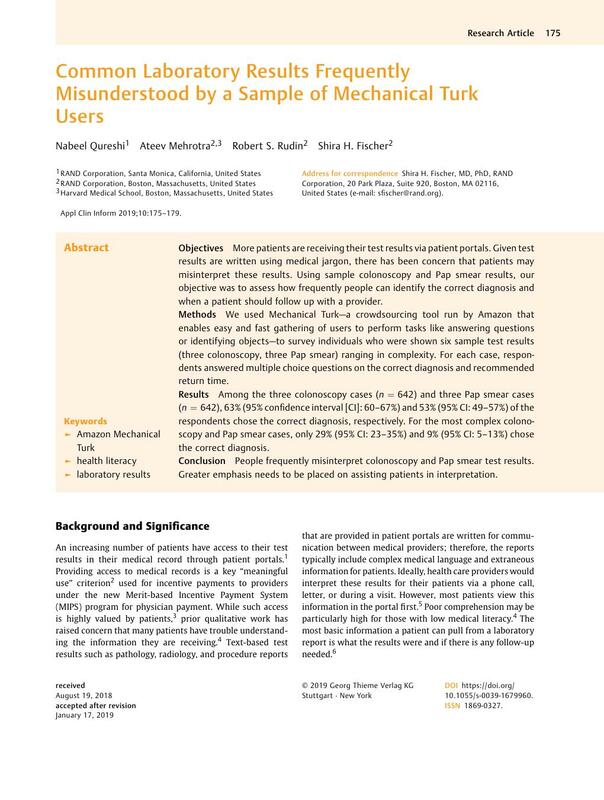 Methods We used Mechanical Turk—a crowdsourcing tool run by Amazon that enables easy and fast gathering of users to perform tasks like answering questions or identifying objects—to survey individuals who were shown six sample test results (three colonoscopy, three Pap smear) ranging in complexity. For each case, respondents answered multiple choice questions on the correct diagnosis and recommended return time. Results Among the three colonoscopy cases (n = 642) and three Pap smear cases (n = 642), 63% (95% confidence interval [CI]: 60–67%) and 53% (95% CI: 49–57%) of the respondents chose the correct diagnosis, respectively. For the most complex colonoscopy and Pap smear cases, only 29% (95% CI: 23–35%) and 9% (95% CI: 5–13%) chose the correct diagnosis. Conclusion People frequently misinterpret colonoscopy and Pap smear test results. Greater emphasis needs to be placed on assisting patients in interpretation. This project was deemed exempt by RAND's institutional review board.